I am in Toronto. Last Fall I covered my 5 Cedars in burlap to protect them for the winter. In early Spring I uncovered them to discover 4 of them had many dead branches and foliage. Please see attached photos. My neighbour said the recent late spring freezing rain storm may have caused it because the dead parts of the trees were mostly all on the same south facing side. I was hoping to save these trees by continuing to water regularly and give them a chance to regrow. But it’s now been about 8 weeks and it the trees don’t seem to be recovering. In fact the dead parts seem to be spreading. I am looking for suggestions about what to do next. Should I dig out the trees altogether and replace them with new Cedars? If so when is the best time to replant? Now or in the Fall? We receive many questions regarding cedars, and browning seems to be a very common problem. The warm weather that we experienced this year in February followed by the severe drop in temperature and freezing rain in April resulted in dieback and desiccation. Unfortunately, cedars will not regenerate green needles on brown stems. 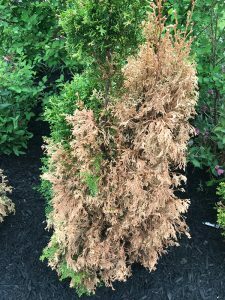 If you have not seen any change in the last 8 weeks after your regular watering and fertilization then my suggestion would be to dig out the cedars and replace them with new cedars. The link Browing Pyramidal Cedars contains a list of archived questions on our website which contains information on the proper care, fertilization and pruning of cedars.